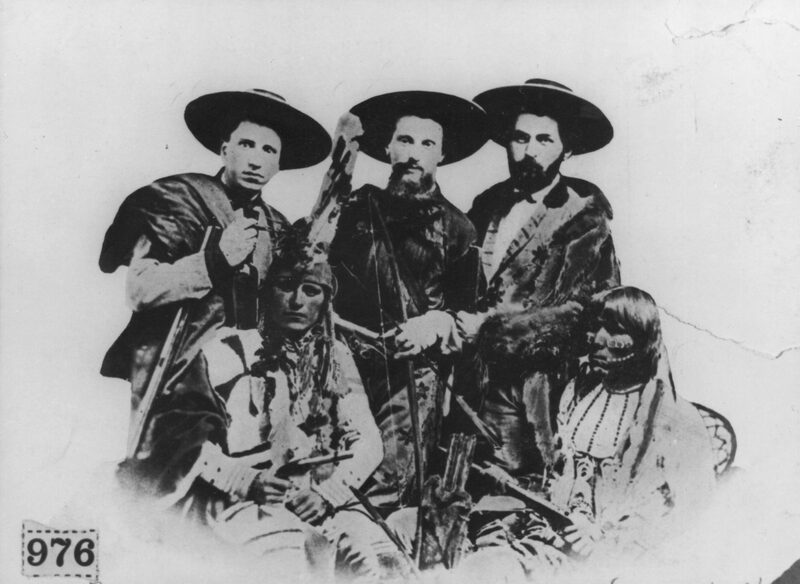 Jewish freighters on the Santa Fe Trail with hired Kiowa Indian scouts. Photo courtesy of the Palace of the Governors Photo Archives. The Jews’ Indian: Colonialism, Pluralism, and Belonging in America (Rutgers University Press, 2019) is a new book about the history of Jewish encounters with indigenous peoples in the 19th and early 20th century United States and the stories Jews told each other about these encounters. Moving beyond the singular focus on Zionism in discussions of Jews and colonialism, this text argues that we should view Jewish presence in North America, and modern Jewish history in general, as part of a broader global process of colonial expansion. I spoke to author David S. Koffman, the J. Richard Shiff Chair for the Study of Canadian Jewry and Associate Professor of History at York University in Toronto, about the historical relationship between colonialism, diaspora, and whiteness, and contemporary Jewish discussions about indigeneity in the US and Canada. Hadas Binyamini: Can you explain the title? David S. Koffman: The title The Jews’ Indian is a play on a Robert Berkhofer, Jr.’s book from 1978, The White Man’s Indian: Images of the American Indian from Columbus to the Present. I read that book in grad school and I liked the way that it forced the reader to think about the subject and the object. This was a book that was not about Native Americans. It was looking at white people’s representations of Native Americans. My interest is in seeing colonial actors as people who had ordinary economic and political concerns, who are desperate in their own way. I think that this study forces us to reckon with some of the political and moral ambiguities of settler-indigenous relations. Jews in the 19th century, like many others who arrived in the frontier West seeking to eke out a living, were often fleeing hunger, political violence, and disenfranchisement. Though they arrived as more powerful than Native Americans, they were not official state actors—they were, in a certain sense, refugees. We tend to think of the agents of settler-colonialism as military or political elites who created the conditions for expansion. But many were just pawns in the larger process. Jewish-Indigenous encounters were complicated; it’s not really a matter of good guys and bad guys, even though there are beneficiaries and losers. HB: What was the experience of Jews in the West, and what is their relationship to land ownership? DSK: This is a tricky question with regard to how Jews thought about land—the background of the story, of course, is the Jewish inability to own and work land in much of Europe. Jews had much more motility in America, meaning they could move around land without any restriction, and they could own it as well. But they generally saw land as a commercial vehicle, as property. Western US land was not something viewed with any necessity or specific spiritual or cultural connection. The Jews who worked provisioning the military—they’re called sutlers—moved around and sold dry goods and foodstuffs to the military. They were not deeply connected to this land, and they didn’t assume they would be tied to it in the future—though they did expect to be tied to America more broadly. There were also some Jews who saw the expansion, the great land grabs and speculation in land, as an incredible business opportunity, and they tried to get a piece of this pie. Folks who were out there in the “frontier” West were generally small-time merchants, peddlers or traders, taking advantage of the commercial build-up of small towns and cities. This didn’t actually put Jews into direct contact with Native Americans, because these Western emerging towns forcibly displaced Native Americans. But Jews still certainly benefited from the larger colonial displacement that happened as settlers established towns and trade routes between these towns throughout the West. HB: With Jews benefitting from Native peoples’ colonial displacement, was there any difference between Jews and other white settlers that moved westward? DSK: There’s a “yes” and a “no” answer here, but I’d say that the “no” is more important. The settler experience was self-serving in the most basic sense. There were commercial opportunities, and settlers saw [interactions with] Native Americans both as impediments and as opportunities to advance their own goals of settling the land. Jews settled, they made homes that were semi-permanent, and then permanent, as other whites did. They were part of a violent process of dispossession, and sometimes very proud of that process. We can see this in lectures that “old-timer” Jews of the West gave at pioneer society meetings, in the letters and diaries they kept, and in the obituaries and local histories left by Jews living in the West. It’s not uncommon to find triumphant declarations by Jews about advancing “civilization in the wilderness.” They not only did their part in the military as individuals, but sometimes committed acts of vigilante violence in order to hasten the colonial settlement process. So in all those most important ways, they’re not different. But I would say Jews are different from their non-Jewish counterparts, in so far as they understood their participation in the colonization process in ways that made sense to them as Jews. For example, they understood the process as an important moment in the long arc of Jewish history, and the American republican experiment as one that might promise an end to age old hostilities, limited rights, and a constant feeling of unwelcome—a kind of end to the exilic condition. When Jewish pioneers cast themselves in the role of the brawny, hyper-masculine frontiersman, to take another example, they were quite self-consciously hedging against negative stereotypes of the Jewish schlemiel or luftmensch. They made Jewish meanings out of colonial expansion in the West, even though they ultimately did the same things that all the other non-indigenous folks did in the settlement process. HB: I was struck by how different this history is from a popular narrative about Jews and whiteness: Jews were immigrants that became white in the ’50s and ’60s. How does your book help us rethink Jews and race in the US? DSK: The important thing to keep in mind is that race wasn’t always about black and white in the United States. We should remember the so-called “yellow races” and “red races,” and other racial categories where Jewish racial ambiguity and indeterminacy fit in. On the other hand, with a wide enough lens, we can see that Jews did get the benefits of whiteness from their very landing in the US, certainly in the West. This is easily seen in the lack of legal restrictions that are imposed on Jews. In fact, it’s the laws and all the state resources, including its military resources, that support Jews as settlers, against the best interest of Native Americans. HB: Why do we need to consider colonialism in our understanding Jewish history? DSK: In the big picture in Jewish history, there were mass migrations that fundamentally altered where, and how, Jews lived in the world. Between the 1820s and the 1920s, close to 2.5 million Jews emigrated to the US. Over the course of this century, Jews moved out from under European empires and went to those empires’ margins, under the auspices of a super-process of colonialism. They went with the cutting edge of capitalism. They intentionally went to places with more political inclusion, arriving in North America, in Canada, the US, Australia, New Zealand, South Africa, the Caribbean and Latin America as citizens. Their quest for citizenship and emancipation in Europe did not define their communal experience in these new countries for very long; their rights were protected by these “new world” liberal states. So there was no issue there. It’s not the story. I see the story by following the money and the people—colonialism in the broadest terms. Historians usually emphasize immigration as the defining process for Jewish presence in North America. Colonialism is just the obverse side of immigration. And it is colonialism, I think, that is the force behind this movement. It might be a good thing for scholars [of Jewish history] to think through colonialism as this arch-narrative that makes sense of different sorts of modern Jewish experiences in places that aren’t often compared, but ought to be, like Latin America, Australia, and Canada. HB: The book does reach Canada at some points. Have Jewish-Native encounters followed a parallel path in US and Canada? DSK: For the most part they followed the same path; again, they’re part of the same overarching process. And I would argue (although I haven’t done all the necessary research) that there are similar patterns to be seen in the Jewish experience of Australia, Latin America, and New Zealand, where Jews also encountered indigenous peoples as settlers. The differences between Canada and the US are becoming more important. A few years ago there was a process that the Canadian federal government underwent to establish a Truth and Reconciliation Commission (TRC) largely centered around the indigenous experience at state-run residential schools. The TRC concluded that the Canadian government enacted a plan of cultural genocide by taking thousands of kids away from their homes and communities and forbidding their cultures, languages, and religious practices. This process concluded with a list of almost 100 recommendations for all sorts of institutions to change the way that they operate, to make space for a truer reconciliation process with First Nations, Métis and Inuit peoples. Now in Canada, there’s policy discussion and a great amount of public debate about settler-indigenous relations. It’s high profile, it’s on the news all the time, it’s a conversation that touches on literary matters and political matters and public school education and commemorations like Canada 150. The indigenous-settler discussion is the big race-based discussion here in Canada, unlike in the States, where the discourse is largely about black and white at the moment. This means that Jews in Canada are now much more interested in thinking about land acknowledgements and the reconciliation process. They are starting to think about how they might engage in this process as Jews and as Jewish Canadians. HB: What are some of the answers they’ve come up with about how to engage with this process? DSK: Broadly, Jewish individuals and organizations have been drawing out parallels between the shared histories of suffering and persecution. There’s certainly talk between Holocaust survivors and residential school survivors and their descendants about genocide, comparing notes about resilience, healing and intergenerational trauma. Jewish institutions put on programs that engage with indigenous peoples: they arrange junkets to Israel for Indigenous leaders; environmentalists create Passover seders focused on colonialism; ritual committees of synagogues discuss land acknowledgements; social justice committees in Jewish organizations think about practical initiatives and symbolic solidarity gestures with and for local Indigenous communities. This is a discussion that crosses denominational lines, and also seems to be crossing the political left-right divides in the Jewish world. The other part of how Canadian Jews think about Jewish-indigenous relations has to do with cultural and political sovereignty.There’s a lot of proxy discussion happening about Jewishness and Zionism, with Jews in Canada (and the US) increasingly evoking the language of indigeneity to describe their own identities and histories. Some draw out the parallels between, say, Hebrew revival as a model for Indigenous language renaissance, or between Jews’ and Indigenous peoples’ religious attachments to sacred lands. There are also Jews critiquing Israel as a parallel to settler-colonialism on this continent. North American Jews, in other words, make rhetorical uses of indigeneity to support their understandings of Jewish history and their different views of Zionism as a colonial or anti-colonial operation. What I don’t see is a very deep or serious reflection by Canadian Jews (or by American Jews) on the extent to which the Jewish experience in Canada or in the States has been a colonial experience. There’s a tendency not to see ourselves as oppressors, or as part of a history of colonialism. I would hope that readers can begin to think about their own community histories, their local histories, and even their own family histories as connected to this larger, longer process of colonialism—colonialism not as a dirty word, just as a fact. A fact that had many serious implications for others, and has been a major force of disruption and unsettlement. Hadas Binyamini is a PhD student in History and Hebrew and Judaic Studies at New York University.